At the CGNA February meeting, the developer of 360 Smith Street William Stein made a presentation of his controversial 49-unit condo development that would be built over the F and G Subway Plaza at Second Place. His architect Armand Quadrini of KSQ Architects promised to get back to the elected officials about how much of the plaza would be covered by the development. When his architect failed to get back to them, this blogger published a picture showing that 1/3 of the plaza would be covered over by the condo project. 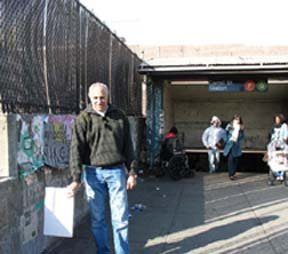 Council Member Bill deBlasio’s and Assembly Member Joan Millman’s legislative aids sent the picture to the developer, and “a picture get action.” Last Thursday, Stein made a special trip in from Garden City to walk the aids through the plans for the plaza. He also graciously agreed to come in from Long Island again last Sunday to show the plans to community members. He brought his pictures and challenged the correctness of the rendering that I posted on my blog which showed the 22-foot portion of plaza that would be be built over and that the community would loose 1/3 of the plaza to the development. I responded that I know the 1/3 claim didn't include the 14-foot sidewalk, but the illustration showing what portion would be lost is correct. It was done by a professional from a top engineering company, and the perspective is aligned perpendicular to the horizon and diagonally with the property line. He told us that the area around the newsstand was actually commercial space and shouldn’t be considered as lost public space. He plans to put in a news and sundry store with an entrance on Smith Street that would be operated by the current newsstand operator. In response to the picture, his publicist must have sent a press release to the Brooklyn Paper. It published an article dated April 5, 2008, “Plaza-Palooza,” without soliciting community comment. The article stated, “Stein’s design show there will be a 20-foot covered path to the subway entrance, because his building will project over what is now open space.” This is the 22-foot of open space that I said would be lost. Stein said that there would be a clear canopy over the entrance. Since there is no commercial overlay for retail on that block of Smith Street, he assumes that the community would support a change of zoning to allow a commercial overlay for the sundry and other retail shop being considered for the Smith Street frontage. Billie Stein showing us where the new entrance pathway to the subway will begin. He said that the roof of the subway extends under most of the parking lot, and that he has to build a platform over the roof to support the building. The subway roof supposedly was constructed for a load-bearing for a 4 or 5-story commercial building and should support his building which would weigh less, but the MTA still required the platform. Neighbors complained about the vibrations when they did the test borings in the parking lot; now the concern will be about what will be the damage to their homes when they drill to bedrock to secure the platform. He said that constructing the platform is very expensive, and that he will lose the ground floor for parking. He said that this is why it is necessary for him to build to the maximum of the FAR that is allowed for wide streets, but he agreed with the community pursuit of a change to the zoning resolution to stop the wide-street allowance. He said that he is also providing amenities for the public easement for access to the subway, such as lighting and maintenance without getting any FAR allowance like most buildings. The white wall in the rendering is the retaining wall that currently separates the plaza from the parking lot. Several weeks ago, Stein asked the NYC Parks Department for a permit to remove the trees on the plaza. They supposedly gave him permission to remove the two trees on the 22-feet portion of the plaza that is privately-owned, as the NYC Parks Department has no jurisdiction on private property. Parks would not allow removal of the other three honey locust trees just because the architect wanted different trees. I said that I preferred that the courtyard of the parking lot look like the other courtyards along Second Place. He also explained that the incline of the parking lot prevented this, and that it needed to be terraced, and asked our advice on putting in planters along the sidewalk.